In my career and on my own time when I’m traveling, I take either my MacBook Pro, iPhone or my iPad along to keep in touch or to do some writing. With the iPad, I found the onscreen keyboard wanting and when I’m at home using my MBP closed with an external monitor, adding an external keyboard got to be a bit tiring at times having to take the keyboard out from where I’ve hidden it until I need it. 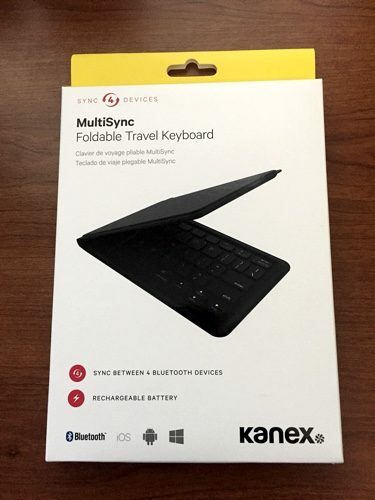 Kanex’s Multi Sync Bluetooth Keyboard for Mac, iPad and iPhone has made things a lot easier. The keyboard’s ability to handle up to four devices makes switching and use a lot easier. The small footprint of the unit makes it easy to put in your pocket or slip it into your laptop/iPad bag and off you go. Designed by Kanex with size and simplicity in mind, the Multi Sync Bluetooth keyboard is small enough to fit in a pocket yet sized to be utilized just like a laptop keyboard. Folded up the keyboard is 6 1/2” x 4”; open it is approximately 13” in length. The keyboard itself is set at an angle that for long time regular keyboard users may take a bit of time getting used to; at least for me it did. After decades of typewriter then computer keyboard use, it took me over two weeks to finally adjust to the change. 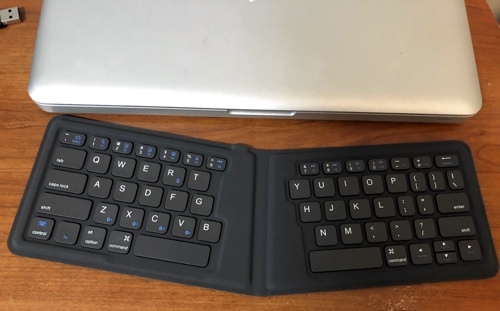 The nice thing is that once my hands and mind finally caught on, the portability of the keyboard made things a lot easier, especially with my iPad. Setting up (pairing) of the keyboard is simple and easy to do. First things first; use the USB cable that’s included and fully charge the keyboard. On whatever device you want to pair the keyboard with, make sure that Bluetooth is turned on. Once that is done, open up the keyboard, press the “Fn” and the Bluetooth key (Z, X, C and V keys) to assign whatever device you want to a particular key. For me, I started with the Z key and assigned it to my MacBook Pro, then went to the X key and assigned that to my iPad. I even set the keyboard up with my iPhone. I really came to appreciate the capability of the unit to switch between different units, be it a laptop or an iPad. With this keyboard, I can now switch when I need to while sitting at my desk or relaxing while watching TV. Sorry but my fingers just do not have the flexibility anymore to do two finger texting or typing, the keyboard makes it a lot easier to do. Battery life is quite good, I’m able to type for several days before I need to recharge the unit. 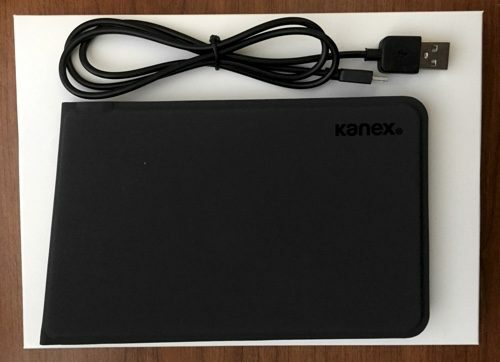 Kanex even included a built-in system for you to check the status of the battery. You simply hit the “Fn” and “R”keys and hold them for 5 seconds at which time the green light will flash 4 times for 100%, 3 times for 75%, 2 times for 50% and 1 time for 25%. If the red light flashes, it’s time to charge the keyboard again. Kanex also provides a 1-year warranty on the keyboard. All in all, based upon my use and its capabilities, I give the Kanex Multi Sync keyboard a My Mac rating of 8 out of a possible 10.